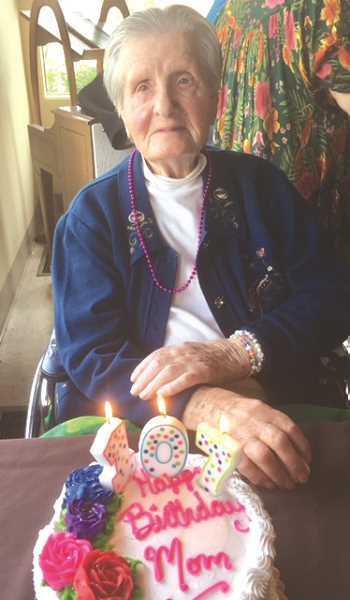 Ekaterina M. Shevchenko celebrated her 107th birthday on Nov. 18. She was born Ekaterina M. Vodopianoff in 1911 in the Ukraine. Her family's strong faith prompted them to leave their country because of great upheaval and turmoil. America was their destination. They crossed into China in 1933. THere she married Alexander E. Shevchenko in early 1937. They lived there for 16 years and had five children. Then they moved to Paraguay, which was accepting refugees at the time. They lived there for eight years and had two more children. Once again, the couple moved, along with their seven children, to the United States, arriving in San Francisco on Sept. 10, 1957. Alexander passed away at the age of 77 in 1990. Ekaterina continued to live on her own next to the Russian church in San Francisco until November 2016, when she moved with her youngest daughter and her husband to Oregon. Due to a fall and bone break in her right leg a few months ago, she is in a rehabilitation facility in Grants Pass. While Russian is still her primary language, she is able to communicate well. Ekaterina is still an extraordinary, brave, strong and sharp woman. In addition to her seven children (Benjamin of Woodburn, Alex, Luba, Peter, Raissa, Nick and Nida), she has 26 grandchildren, 35 great-grandchildren and four great-great-grandchildren.